You cannot add "Tails of Equestria: Get Started Bundle!" to the basket because the product is out of stock. Tails of Equestria: Adventure Bundle! Get all the latest adventures for Tails of Equestria in this one limited-time bundle offer. 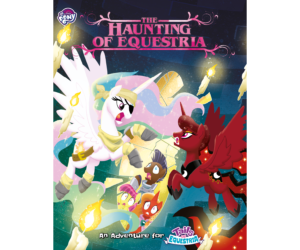 The Festival of Lights, Judge Not by the Cover, and even the upcoming story, The Haunting of Equestria, are all included at a special bundle price. Get all the latest adventures for Tails of Equestria in this one limited-time bundle offer. The Festival of Lights, Judge Not by the Cover, and The Haunting of Equestria, are all included at a special bundle price. In The Festival of Lights, your Pony Characters will delve deep into the ground and uncover the hidden city of Umberfoal. Having slept for a thousand years, the ponies of Umberfoal awake to brand new dangers that rise up from the dark below. Next, in Judge Not by the Cover, the discovery of an ancient map in The Crystal Empire sets the Pony Characters on a quest for a magical library that only appears once every hundred years. What enchantment lies on the library? What lurks within its deep chambers? And who is the library’s enigmatic curator? Finally, in The Haunting of Equestria, an old and dark magic reawakens in Equestria on Nightmare Night. As the spooky celebrations get underway in Ponyville, a frightening force threatens to bring eternal night once more!